When a woodcutter teaches students to chop wood, he tells them focus on the chopping block, not the wood. It’s more accurate to say they are not chopping wood so much as chopping through wood. Similarly, when a career counselor teaches students how to approach an entrepreneurial venture, she tells them to focus on people, not products. It’s more accurate to say they are not making products so much as building networks. Such themes of wood and wisdom got tied together quite closely recently when Zechariah Nelson ’19 was casting about for a cure for calculus. He had not done well on a Calculus 3 test. Upset and restless, he went for a walk, searching for a productive, hands-on way to work through his frustration. As he walked, he thought about the entrepreneurial lectures he had attended on campus as part of the X-Trained Engineering Initiative which Lafayette established as a partner in the Kern Entrepreneurial Engineering Network (KEEN). The lectures, funded through the Kern Family Foundation, focus on instilling an entrepreneurial mindset in students so that they view challenges as opportunities. Zechariah also recalled some of the ideas he had since considered: more manly eye masks (too fussy), a machine that recognized rip currents in the ocean (too complicated). After a while, he found himself in the campus bookstore, browsing the apparel section. 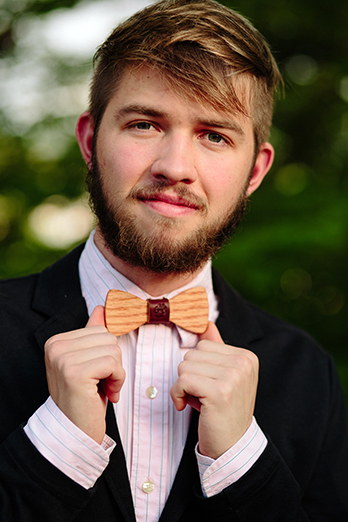 “It hit me to make wooden bow ties,” says Zechariah. Soon afterwards, he approached Erin Evans, associate director of career services at Lafayette, to help him figure out the steps he needed to take to get his venture off the ground. She quickly connected him to Ken Londoner ’89 and Michael Presto P ’18. Both helped Zechariah with the complexities of registering a legal business and also advised and encouraged him on design patent matters. Zechariah is incredulous as he describes how effective the career services office was and how Evans was able to quickly match the process to the product. “She’s very, very awesome,” he says. With the legwork well in hand, so to speak, Zechariah got busy with Collegiate Wood, the name he settled on for his company that designs and handcrafts bow ties. He and his father, a retired pediatrician (a medical field where bow ties are common because grabby toddlers can’t be trusted with neckties) scoured Craigslist for a router, a band saw, a belt sander and a planer. After finding the equipment, the first thing they carved out was some space in the family garage in Havertown, Pa.
With all the kinks worked out, sales began in earnest in May, with about 40 sold during the inaugural month. Collegiate Wood turns out three styles of ties—in oak, cherry and walnut—each with a leather centerpiece stamped either with a Lafayette ‘L’ or a Leopards paw print. 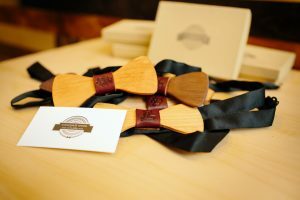 The ties are available through the Etsy online marketplace under the handle LafCollegiateWood. Zechariah plans to use and profit from the endeavor to cover the student loans he uses to help pay for his engineering studies major, and also to help pay for such college-sponsored trips as the one to Florence, Italy, through IDEAL Center for Innovation.